William Castle is a name which still brings a grin to faces of many Horror fans, his films are still loved and admired to this day. Castle is also infamous for gimmick-laden films, often with over-hyped effects and as much as I love his work his gimmicks are the stuff of legend. True some of his films weren't the best but he knew how to draw a crowd and get them in the theatres, he was a true entertainer. In my opinion he truly was a one of a kind. Macabre (1958): A certificate for a $1,000 life insurance policy from Lloyd's of London was given to each customer in case they should die of fright during the film. Showings also had nurses stationed in the lobbies and hearses parked outside the theatre. House on Haunted Hill (1959): Filmed in "Emergo". 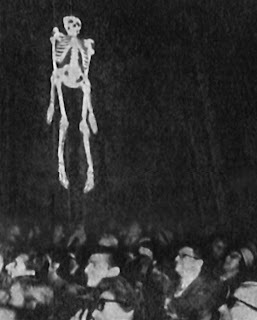 An inflatable glow in the dark skeleton attached to a wire floated over the audience during the final moments of some showings of the film to parallel the action on the screen when a skeleton arose from a vat of acid and pursued the villainous wife of Vincent Price. The gimmick did not always instill fright; sometimes the skeleton became a target for some audience members who hurled candy boxes, soda cups or any other objects at hand at the skeleton. The Tingler (1959): Filmed in "Percepto". In the film a docile creature that lives in the spinal cord is activated by fright, and can only be destroyed by screaming. 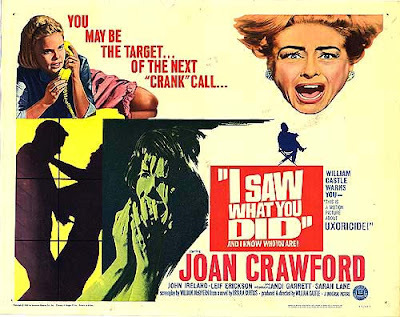 In the film's finale one of the creatures removed from the spine of a mute woman killed by it when she was unable to scream is let loose in a movie theatre. Some seats in theatres showing "The Tingler" were equipped with military surplus air-plane wing de-icers (consisting of vibrating motors) purchased by Castle, attached to the underside of the seats. When the Tingler in the film attacked the audience the buzzers were activated as a voice encouraged the real audience to "Scream - scream for your lives." 13 Ghosts (1960): Filmed in "Illusion-O". 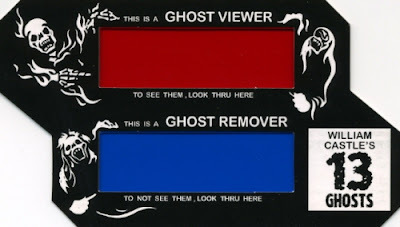 A hand held ghost viewer/remover with strips of red and blue cellophane was given out to use during certain segments of the film. By looking through either the red or blue cellophane the audience was able to either see or remove the ghosts if they were too frightening. However, if you chose not to use the viewer, the ghosts were still somewhat visible. 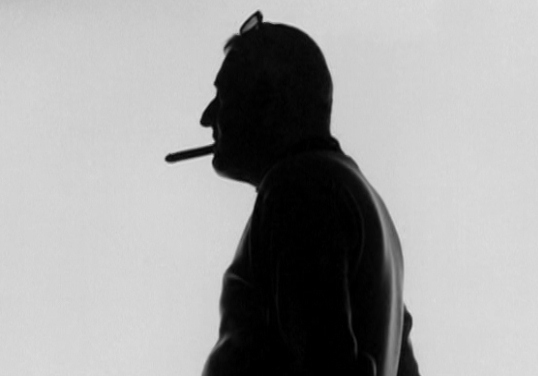 "William Castle simply went nuts. He came up with 'Coward's Corner,' a yellow cardboard booth, manned by a bewildered theatre employee in the lobby. When the Fright Break was announced, and you found that you couldn't take it anymore, you had to leave your seat and, in front of the entire audience, follow yellow footsteps up the aisle, bathed in a yellow light. Before you reached Coward's Corner, you crossed yellow lines with the stenciled message: 'Cowards Keep Walking.' You passed a nurse (in a yellow uniform?...I wonder), who would offer a blood-pressure test. All the while a recording was blaring, "'Watch the chicken! Watch him shiver in Coward's Corner'!" 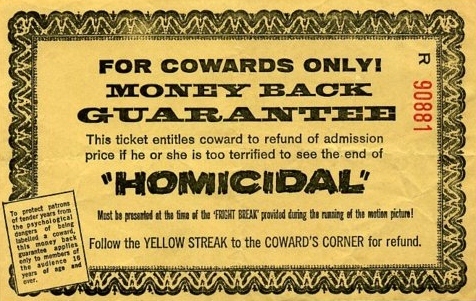 As the audience howled, you had to go through one final indignity, at Coward's Corner you were forced to sign a yellow card stating, 'I am a bona-fide coward.' Very, very few were masochistic enough to endure this. The one percent refund dribbled away to a zero percent, and I'm sure that in many cities a plant had to be paid to go through this torture. No wonder theatre owners balked at booking a William Castle film. It was all just too complicated." Mr. Sardonicus (1961): In this gothic tale set in 1880 London a baron's face is frozen into a permanent grotesque hideous smile after digging up his father's grave to retrieve a lottery ticket left in the pocket of his father's jacket. 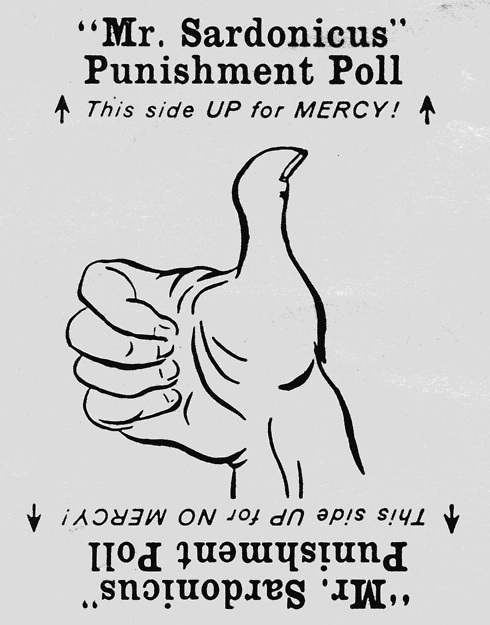 The audiences were allowed to vote in a "punishment poll" during the climax of the film - Castle himself appears on screen to explain to the audience their options. 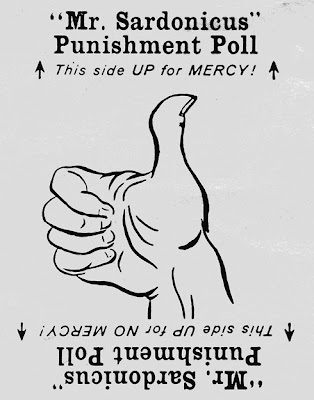 Each member of the audience was given a card with a glow in the dark thumb they could hold either up or down to decide if Mr. Sardonicus would be cured or die during the end of the film. Supposedly, no audience ever offered mercy so the alternate ending was never screened. However, an alternate version was filmed for drive-ins, in which drivers were asked to flash their car's headlights in response. Zotz! 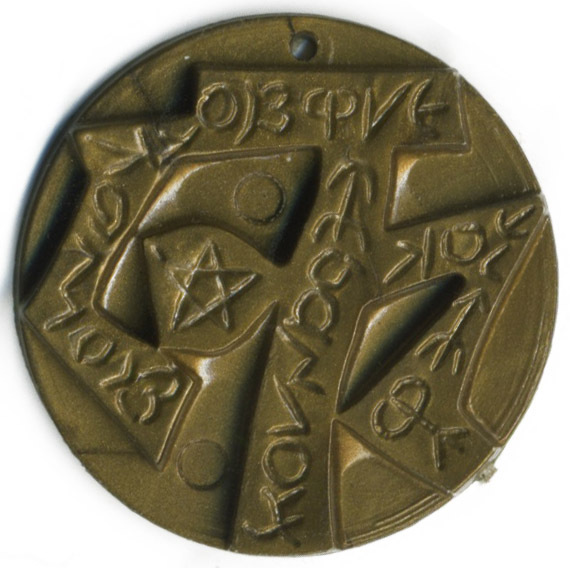 (1962): Each patron was given a "Magic" (gold coloured plastic) coin. 13 Frightened Girls (1963): Castle launched a worldwide hunt for the prettiest girls from 13 different countries to cast in the film. 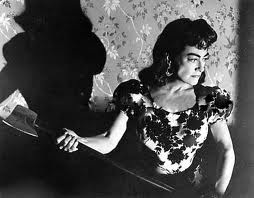 Strait-Jacket (1964): Joan Crawford. Advised by his financial backers to eliminate gimmicks, Castle hired Crawford to star and sent her on a promotional tour to theatres. At the last minute, Castle had cardboard axes made and handed out to patrons. I Saw What You Did (1965): The film was initially promoted using giant plastic telephones but after a rash of prank phone calls and complaints, the telephone company refused Castle permission to use them or mention telephones. So he turned the back rows of theatres into "Shock Sections". Seat belts were installed to keep patrons from being jolted from their chairs in fright. 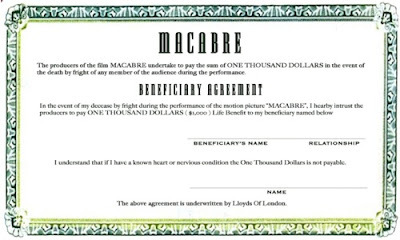 Bug (1975): Castle advertised a million-dollar life insurance policy taken out on the film's star, "Hercules" the cockroach. I do wish we had more of his type around these days, I think it's a safe bet to say he would have so much fun with the modern day Horror fan and vice versa. In a time full of gimmicks, with 3D being the most popular, I'm sure he'd have some amazing ideas to entertain us all with.